2013 was another year when my circle of friends who were authors or in some way connected to the creative process expanded exponentially. I’d never had so many friends and acquaintances who were authors and poets and playwrights, or people who created art in other forms – theatre, dance, music and painting. And to think that I’d lived for four-and-a-half-decades in Bombay and had been in Toronto only for five years. I guess the main reason for this sudden expansion of friends who were creative was because I had begun to focus on these things – going to readings, plays, discussions on creative processes. But I don’t want this memoir blog to become a “who I met and who I now know” sort of narrative; that’d be just plain tedious. If anything, my life in Toronto was turning out to be – in many different ways – the sort of life that I’d always aspired – a mix of hard work, reading, writing, being with people I didn’t dislike, and generally spending time doing the things that I truly enjoyed. Also, blogging helped me focus my thinking and channelize them into ideas. 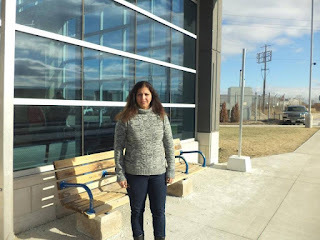 During this exercise of recollecting my decade in Toronto, I’ve been reading the blog posts that I wrote and without being immodest, I find (at least some of them) to be rather good – readable, with content that’d make anyone think. While writing these posts, the process of thinking led me to thinkers of the 19th and early 20th century, when many of the ideas that have come to dominate our world today were being formed. Roman Rolland, Andre Gide, Swami Vivekananda, Lokmanya Tilak, Rabindranath Tagore. The issues that they debated with themselves and with others have helped shape our sensibilities today. At that time (in 2013) the momentum of Narendra Modi-led BJP capturing power in 2014 Lok Sabha election had become a foregone conclusion. Important and contentious issues that went to the core of my belief were being hotly debated – among them were individual rights, religious freedom, the treatment of minorities (especially Muslims), the meaning of Indian nationhood, the Hindu religion, Hindutva, and other such matters. 2013 was the centenary of Tagore’s Nobel Prize for Gitanjali and 150th birth anniversary of Swami Vivekananda. In many ways, both were globalists and yet deeply Indian (Hindu, perhaps?) in their sensibilities. In one of my posts on Tilak and Vivekananda, I said, “Anyone familiar with 19th century social and political history of India will know of two very clear streams within the Hindu society – one which advocated that social reforms should be a priority, and the other section that resisted western-inspired and British-instituted reform measures. This section wasn't opposed to reforms. “They wanted the reforms to be generated from within the Hindu society. That the Hindu society didn't (and doesn't) have any self-regulatory mechanism to have initiated this process is evident from the severe opposition Nehru faced during the codification of the Hindu personal laws. “Today, more than a century later, both Tilak and Vivekananda divide Indians, with both the secular and the communal elements claiming them as their ideals. History is reinterpreted by both the groups to justify these claims. It isn't such a bad thing because it is only through revisionism that we uncover new and concealed facts about the past. Similarly, the significance of individual freedom, a person’s right to dissent, was at the core of the debate between Rolland and Gide. “The ideologies that espoused class struggle became obsolete because they fell short of two fundamentals requirements of human life – freedom and development. The proponents of the ideologies claim that they remain relevant even today and protest that it was the practice of these ideals that subverted freedom and failed to deliver the promise of development. Perhaps, they are not wrong. Individual freedom is at the heart of this debate and was at the basis of the differences between two eminent French writers Andre Gide (1869-1951) and Roman Rolland (1866-1944). Both supported communism – Gide briefly and Rolland during his lifetime. Rolland is known in India because of his association with Mahatma Gandhi and Rabindranath Tagore, and because Swami Vivekananda’s interpretation of the Vedanta influenced him. Along with Leo Tolstoy and Gandhi, Rolland was a firm believer in non-violent non-cooperation. Eventually, individualism triumphed over the collective in the war between communism and capitalism. Even if democracy and capitalism may have emerged as the only acceptable political and economic models in the present century, the struggle to redefine them continues. The gathering storm over the political and economic rights of the indigenous people is a good example of this struggle as is the Occupy Movement. These debates continue to remain relevant in 2018 as Narendra Modi and Donald Trump continue to remain all-powerful and set upon winning the next election (in 2019 in India and 2020 in the US). Ananya Mukherjee-Reed invited me to see Inspirations 2013 at Toronto’s George Weston Recital hall to celebrate the centenary of Rabindranath Tagore’s Nobel Prize for Literature. Two of best books that I read in 2013 were Lisa Moore’s February, and Jerry Pinto’s Em and the Big Hoom. Both are unforgettable. And I was fortunate to interact with two good poets who continue to do good work – Sheniz Janmohamed and Bano Zan. On the last day of 2013, we went to Windsor from where Mahrukh and Che would go to Detroit to see the All-Star game on 1 January 2014 for which Che had bought tickets a year ago. We took the Via Rail train to Windsor. It was a momentous trip; were served breakfast, where for the first time, I saw the Baby Bell cheese and was clueless about what it was or how to open it. We reached Windsor on what was unarguably one of the coldest days of the year only to discover that we’d forgotten Che’s Indian passport that had the US visa back home. So, I’d to take a bus back to Toronto, take the passport and take the morning train back to Windsor. Fortunately, we had a day to spare. But the trip to Detroit was nothing short of a disaster. Mahrukh, who didn’t have the ticket for the game, stood outside the stadium and nearly died of hypothermia. It was that cold. I spent the day in the hotel room writing for my performance review for a job that I’d lose the next year. 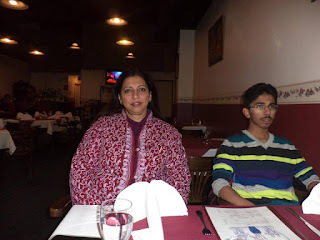 The highlight of the year’s end was a sumptuous dinner we had at an Indian restaurant in Windsor. We welcomed 2014 on the banks of the Detroit River that divides Windsor and Detroit.